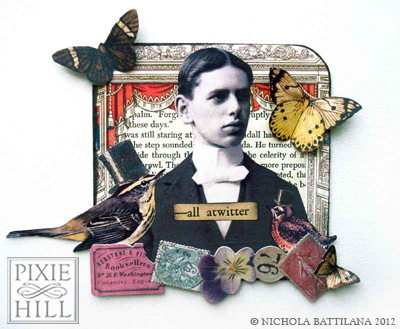 Pixie Hill: Meet the Alpha Stamps Design Team Blog Hop! Meet the Alpha Stamps Design Team Blog Hop! I mentioned a few days ago that I've had birds on the brain. 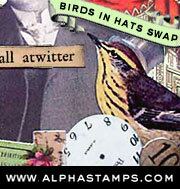 This month the folks at Alpha Stamps sent along some new Collage Sheets for their Birds in Hats Swap. 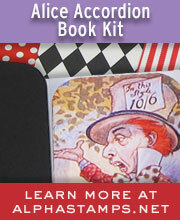 The birdy images are really, really nice and the Just Hats Collage Sheet is fabulous. You can click the graphic at the right for more information on the swap. Being part of the Alpha Stamps design team has been grand. It's pushed me creatively, I've used some fabulous products I may not have tried otherwise, and I'm totally smitten with all of the other talented team members. It's a real pleasure to be in their creative company and I'm chuffed to take part in this "Meet the Team" blog hop. If you aren't familiar with my work, most of my making is heavily influenced by old stuff, dust, history, folklore, nature, fairy tales and nonsense. I adore funny looking people in old photographs and I think that vintage paper is just about the nicest thing there is. I draw inspiration from every nook and cranny I can... from Georges Méliès to Monty Python to the moon - it's all fair game. Anywho, below are the two "Birds In Hat's" coasters I created for the new swap theme. If you leave a comment below (be sure I can contact you) you could win the pair of them! Easy peasy. Check back on Monday, June 12 to see if you've won! Now, don't forget to hop on over to the next Alpha Stamps Design Team Member Blog for even more chances to win some fabulous artwork by some very talented folks! Love the coasters! Have to be the coolest ones I have seen. Wonderful coasters! You certainly have a way with all that dust and old stuff and nonsense. Outstanding coasters. love birds and butterflies. Great coasters; very ancestor-like and I love the extra touches that add so much to them. Just luv 'em all! Wonderful pieces of creativity. Thank you for the chance to win one of your pieces of gorgeous art. enjoying all our feathered friends! this has been great...thank you! Love your birdies! I especially like how some of the embellishments hang over the edges. Great job! what great coasters!! I love that you used these masculine faces surrounded by the birds and butterflies!! thanks for the chance to win! Oh, my your coasters are fantastic! So creative! Fun coasters. Thanks for the chance to win them. Your coasters are awesome! 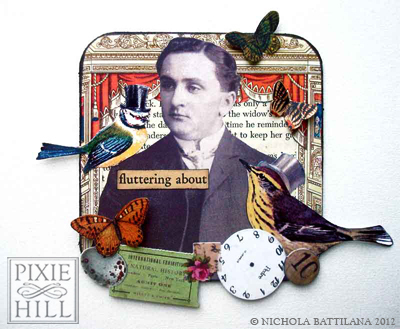 I love the combination of butterflies, birds, and vintage ephemera. Thanks for the chance to win one. Love the birdie coasters. Thanks for giving us all a chance to win! Very creative work! Thanks for sharing. ooo not one but TWO pieces of your amazing creativity...thank you so much for the chance to be the very lucky winner! Love your creativeness!!! Thank you so much for sharing with us! What fun, I like your style! Such sweet little birdies and I do adore them! I love your gorgeous coasters! Love the imagination that went into creating your coasters. Enjoyed visiting Pixie Hill. Thank your for a chance to win a pair of your wonderful coasters. So cute how the birds are looking at these fine gentlemen!! Your coasters have such a fun "mood" to them, very well composed. Great work! i am ever one of your biggest fans...i love everything about your artwork. so glad you are on the alpha stamps team! these are wonderful! thanks so much for the chance to win your giveaway! gorgeous coasters. love the contrast. hahah you are too funny. go now. ok ok I'm going. your art is gorgeous. I just love those coasters. they look so gentlemanly sophisticated. If that's even a word. I thought it sounded good. wow your art blog is very good. I have found a few more blogs that I am going to start stalking on this blog hop. great artists on it. thank you for sharing and thank you for giving us all a chance to win your awesome art. Love your two gentlemen coasters! Your coasters are way too cool! So creative and lovely!!! I love it all!!! I love your blog and all you do. You're the best! I love the coasters! Love the papers and the work also love the hop. Clever way to work your grandfathers into the project! (Kidding about the grandfathers!) Thanks for the fun coaster ideas. Great coasters!! Love the sentiments, so clever. This has been the best blog hop I have ever participated in.Your coasters are delightful! Great inspiration. Very lovely pieces of aft. I love how you went 'off the edge' with your coaster... And I happen to like dust and old stuff too! Nichola, I love how you "set the stage" using the curtains, Darling coasters. Love all of your work. Congrats! I love you art! It inspires me, please add me to you give a way. Your blog is beautiful..and I love your coasters. I agree with the sentiment about "otherwise I might not have tried" I feel that way when I enter swaps..thanks for the encouragement and inspiration.